This article is about the singer Julio Iglesias. For his father, see Julio Iglesias Sr. For his son, see Julio Iglesias Jr. For other uses, see Julio Iglesias (disambiguation). This name uses Spanish naming customs: the first or paternal family name is Iglesias and the second or maternal family name is De la Cueva. Julio José Iglesias de la Cueva (Spanish pronunciation: [ˈxuljo iˈɣlesjas]; born 23 September 1943) is a Spanish singer, songwriter and former professional footballer. In 1983, he was celebrated as having recorded songs in the most languages in the world, and in 2013 for being the Latin artist with the most records sold in history. Iglesias is recognized as the most commercially successful Continental European singer in the world and one of the top ten record sellers in music history, having sold more than 250 million records worldwide in 14 languages. It is estimated that during his career he has offered more than 5000 concerts, having performed for over 60 million people on five continents. In April 2013 he was awarded in Beijing as the most popular international artist in China. In Brazil, France, Romania, Italy, and others, Iglesias is the most successful foreign record seller, while in his home country, Spain, he has sold the most records in history, with 23 million records. During his career, Iglesias has won many awards in the music industry, including the Grammy, Latin Grammy, World Music Award, Billboard Music Award, American Music Award and Lo Nuestro Award. He has been awarded the Gold Medal for Merit in the Fine Arts of Spain and the Legion of Honour of France. UNICEF named him Special Ambassador for the Performing Arts in 1989. He has been a star on the Hollywood Walk of Fame since 1985. In April 2013, Iglesias was inducted into the Hall of Fame of Latin Composers. Iglesias was born in Madrid to Julio Iglesias Sr., a medical doctor from Ourense who became one of the youngest gynecologists in the country, and María del Rosario de la Cueva y Perignat. Iglesias's paternal ancestry comes from Galicia, his paternal grandparents were named Manuela Puga Noguerol and Ulpiano Iglesias Sarria. His maternal grandparents were José de la Cueva y Orejuela (1887–1955), and Dolores de Perignat y Ruiz de Benavides, who was a native of Guayama, Puerto Rico. The name "Iglesias" translates as "churches;" likewise, Iglesias is of Jewish ancestry from his maternal side, having mentioned that his mother's family name, "de la Cueva y Perignat," meaning literally "of the cave" and referring to Jewish people in hiding, is a very common Jewish name. He alternated playing professional football with studying law at the CEU San Pablo University in Madrid. In the earliest years of his young adulthood, he was a goalkeeper for Real Madrid Castilla in the Segunda División. His professional football career was ruined when he was involved in a serious automobile accident, due to which he was unable to walk for two years. Afterwards, he said of those years, "I had more courage and attitude than talent." These were sorely tested when he was involved in that car crash—it smashed his lower spine; his legs were permanently weakened as a direct result, and they still required therapy several years later. During his hospitalization after the accident, a nurse named Eladio Magdaleno gave him a guitar so that he could recover the dexterity of his hands. In learning to play, he discovered his musical talent. After his rehabilitation, Iglesias studied for three months at Bell Educational Trust's Language School in Cambridge, UK. After that, he went back to obtain his law degree at Complutense University of Madrid. In 1968, he won the Benidorm International Song Festival, a songwriter's event in Spain, with the song "La vida sigue igual" (meaning "Life Goes On The Same") which was used in the film La vida sigue igual, about his own life. After this event he signed a deal with Discos Columbia, the Spanish branch of the Columbia Records company, and released his first studio album, titled Yo Canto, or I Sing. The album spent 15 weeks in the Spanish charts, and peaked at #3. He represented Spain in the 1970 Eurovision Song Contest, finishing in fourth place behind Ireland's winning entry, performed by Dana. His entry was the song "Gwendolyne." Shortly after, he had a number one hit in many European countries with "Un Canto A Galicia," sung in Galician, in honour of his father, who hailed from Galicia. That single sold 1 million copies in Germany. In 1975, he found success in the Italian market by recording a song exclusively in Italian, called "Se mi lasci non vale," or "If You Leave Me, It Can't Be." Notable albums from this decade are A flor de piel (1974, with the European hit "Manuela"), El amor (1975), and Soy (1973). He also sang in French; one of his popular songs in this language became "Je n'ai pas changé." In 1979, he moved to Miami, Florida, in the United States, signed a deal with CBS International, and started singing in different languages such as English, French, Portuguese, German and other languages to his music. Two years later, in 1981, he released the album De niña a mujer, which he dedicated to his daughter. (She shared the cover photo with him.) From it came the first English-language hit of his career, a Spanish cover of "Begin the Beguine" which became number 1 in the United Kingdom; he also released a collection, Julio (1983). In 1984, he released 1100 Bel Air Place, the hit album which established him as a star in the English-speaking entertainment industry. It sold over three million albums in the United States alone. The first single, "To All the Girls I've Loved Before," a duet with Willie Nelson, hit #1 on the Country charts and went Top Five in the Billboard Hot 100. It also featured "All of You," in vocal duet with Diana Ross, a Top Twenty Pop hit, that climbed to #2 on the Adult Contemporary Chart with the help of a popular video. In 1984, he had recorded and released the previously mentioned duets with Diana Ross and Willie Nelson. Iglesias won a Grammy Award for Best Latin Pop Album in the 1988 Grammy Awards for the album Un hombre solo ("A Man Alone"). He recorded a duet with Stevie Wonder, "My Love", in his Non Stop album, a crossover success in 1988. In the 1990s, Iglesias returned to his original Spanish melody in Tango (1996), nominated for Best Latin Pop Album at the 1998 Grammy Awards, losing to the Romances album by Mexican singer, Luis Miguel. Iglesias made a cameo appearance as himself on The Golden Girls as Sophia Petrillo's date on St. Valentine's Day 1989. In 1995, Iglesias was the recipient of the Excellence Award at the 1995 Lo Nuestro Awards. In 2001, Iglesias was recognized as the Person of the Year by the Latin Recording Academy. A year later, Iglesias was inducted into the International Latin Music Hall of Fame. In 2003, Julio released his album Divorcio ("Divorce"). In its first day of sales, Divorcio sold a record 350,000 albums in Spain, and reached the number 1 spot on the charts in Spain, Portugal, France, Italy, and Russia. In 2003 and 2004, aided by the success of his Divorcio album, Iglesias went on a ten-month world tour which took him from Europe to Asia and then on to North America, South America and Africa. More than half the shows on that tour sold out within days of going on sale. In December 2004, his Dutch girlfriend Miranda Rijnsburger and Iglesias himself recorded a duet of the Christmas song "Silent Night". The song, which was not officially released, also included a voice message from Iglesias, Rijnsburger, and their 4 young children of that time. The song was released online through the singer's official website and a CD was included on their Christmas card as a holiday gift from the Iglesias family to their friends and fans around the world. In 2008, Iglesias recorded another song as a gift to his fans. The family recorded "The Little Drummer Boy" in Spanish and English and included it in the family's Christmas card. Iglesias also made investments in the Dominican Republic's eastern town of Punta Cana, a major tourist destination, where he took to spending most of the year. Indeed, Iglesias became a Dominican citizen in 2005. In September 2006, Iglesias released a new English-language album, which he titled Romantic Classics. "I've chosen songs from the 1960s, 1970s and 1980s that I believe will come to be regarded as the new standards," Iglesias stated in the album's sleeve notes. The album featured his interpretations of Foreigner's "I Want to Know What Love Is," the Wham! selection "Careless Whisper," and Richard Marx's "Right Here Waiting." Romantic Classics was Iglesias's highest debut on the Billboard charts, entering at number 31 in the United States, 21 in Canada, 10 in Australia, and top spots across Europe and Asia. He returned to the studio to record songs in Filipino and Indonesian for his Asian releases of Romantic Classics which helped propel record sales in the Asian entertainment industry. Iglesias promoted Romantic Classics in 2006; it was seen all over the world on television shows. In the United States, for example, he appeared on Dancing With The Stars, where he sang his version of "I Want To Know What Love Is," Good Morning America, The View, Fox and Friends, and Martha Stewart. In 2008, Iglesias made a music video with Gulnara Karimova, the daughter of Uzbek dictator Islam Karimov. In March 2011, the artist launched a new studio album called 1 (or Numero 1). Iglesias's performance of the song "La Mer" ("The Sea") is featured in the soundtrack of the 2011 film Tinker, Tailor, Soldier, Spy. The performance comes from a live album, which had gone out of print by the last days of December 2015, that he recorded live at the Olympia theater in Paris in 1976. At the beginning and the end of the recording, Iglesias introduces the song, and his backing musicians, in fluent French. In October 2012, Iglesias performed a concert in Equatorial Guinea, where tickets were reportedly $1,000 each. On 1 April 2013, in Beijing, he received two historic awards: First & Most Popular International Artist of All Time in China, an award given by Sony Music China and which was presented to Julio by the world-renowned Chinese artist Lang Lang, and the Guinness World Records for the Best-selling Male Latin Artist. As Iglesias is a composer and lyricist, some of his songs[which?] being of his own authorship and composition, on 23 April 2013, he was inducted into the Latin Songwriters Hall of Fame, alongside Armando Manzanero and José Feliciano. In 2015, as was announced,[when?] Iglesias was slated to perform a concert (complete show) for the first time with his son Julio Iglesias Jr. in a tour in Romania, on 22 May at Sala Polivalentă in Cluj-Napoca and 2 July at Sala Palatului in the capital city, Bucharest. Berklee College of Music, the most important private university of music in the world, named Julio Iglesias Honorary Doctor, in Boston, on May 9, 2015, in recognition of his achievements and influence in music, and for his enduring contribution to American and international culture. On 29 January 1971, Iglesias married Isabel Preysler, a Filipina journalist and television host. Preysler, a Filipino of Spanish ancestry, was also a member of the wealthy and aristocratic Perez de Tagle family. The couple had three children: Chabeli (born 3 September 1971), a socialite; Julio Jr. (born 25 February 1973), a singer; and Enrique (born 8 May 1975), an internationally successful singer-songwriter, actor, and record producer. In the 1970s, Iglesias and his family were extensively depicted on the front pages of international newspapers and magazines. The marriage of Iglesias and Preysler ended in divorce in 1979. Whenever Iglesias was not on tour, he spent his time at his Miami residence, purchased in 1978 for $650,000. The mansion on the private Indian Creek Island, whose interior design was made by his true love Virginia Sipl "LA FLACA", was placed on the market in 2006 for a quoted $28 million, making it one of "Ten Most Expensive Homes in the South" in 2006 according to Forbes magazine. After his divorce, Iglesias lived with Dutch model Miranda Rijnsburger (b. 1965), 22 years his junior, whom he married on 26 August 2010 in a small church in Marbella, Spain. They had five children: Miguel Alejandro Iglesias (born 7 September 1997), Rodrigo Iglesias (born 3 April 1999), twins Cristina and Victoria Iglesias (born 1 May 2001), and Guillermo Iglesias (born 5 May 2007). They took up residence in the Dominican Republic, where Iglesias had acquired several hotel complexes, as well as the Punta Cana International Airport, which he acquired jointly with other investors, including fashion designer Oscar de la Renta. On 19 December 2005, Iglesias's father, Julio Iglesias Sr., died of a heart attack at the age of 90. A week before his death, it became known that the 42-year-old wife of Julio Iglesias Sr., Ronna Keith, was pregnant with their second child. Their first child, Jaime, was born on 18 May 2004. The second child, Ruth, was born on 26 July 2006. In 2008, after his house in Indian Creek did not sell at his asking price, he ordered it razed and said he planned to build another on the lot. In 2012, he purchased the property next door for $15 million and announced that he planned to build a new home on the combined properties. ^ Murashko, Alex (9 August 2000). "Hands Across the Water, to Spain's Galicia". latimes.com. Retrieved 30 November 2013. ^ Moral Roncal, Antonio M. (2003). Cuba ante la Guerra Civil Española: la acción diplomática de Ramón Estalella. Editorial Biblioteca Nueva, S.L. ISBN 8497421671. Retrieved 30 November 2013. ^ "Julio cumple 67 años en plena gira mundial". elcorreogallegos.es. 10 February 2010. Retrieved 30 November 2013. ^ "Julio Iglesias tendrá una estrella en el Paseo de la Fama de Puerto Rico". Retrieved 11 September 2016. ^ "FRONT". The Miami Herald. 12 July 1995. Retrieved 30 November 2013. ^ Brinn, David (12 November 2013). 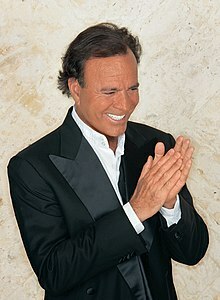 "Julio Iglesias still speaks the language of love". jpost.com. Retrieved 30 November 2013. ^ a b "El personaje de hoy". oem.com.mx. 23 September 2009. Retrieved 30 November 2013. ^ Tiempo, Casa Editorial El (10 July 2011). "Julio Iglesias no se olvida de vivir". El Tiempo. ^ a b Dougherty, Steve; Gold, Todd (29 August 1988). "Julio Iglesias' Good Life Demands Wine, Women, Song—and More Women". people.com. Retrieved 30 November 2013. ^ a b Figueroa, Acton (2004). Julio Iglesias and Enrique Iglesias. Rosen Publishing. ISBN 1404202609. Retrieved 30 November 2013. ^ Siim, Jarmo (11 October 2008). "Iglesias praises Eurovision as a learning moment". eurovision.tv. Retrieved 30 November 2013. ^ "Singer in Alabama eyes bid for the Irish presidency". The Tuscaloosa News. Associated Press. 8 August 1997. Retrieved 30 November 2013. ^ Trust, Gary (20 May 2011). "Ask Billboard: Readers' Favorite Charted Odd Couples". billboard.com. Retrieved 30 November 2013. ^ "DIANA ROSS". michiganrockandrolllegends.com. Retrieved 30 November 2013. ^ ""Latin Pop Performance" on Rockonthenet.com". Retrieved 17 November 2017. ^ "Lo Nuestro – Historia". Univision (in Spanish). Univision Communications. Archived from the original on June 26, 2015. Retrieved March 8, 2014. ^ Susman, Gary (May 7, 2001). "Model Patient". Entertainment Weekly. Retrieved November 8, 2010. ^ "International Latin Music Hall of Fame Announces Inductees for 2002". 5 April 2002. Retrieved 31 October 2015. ^ "Julio Iglesias dice estar "enamorado" de República Dominicana". diariolibre.com. 21 October 2009. Retrieved 30 November 2013. ^ a b Pizano, Pedro. "Crooners and their Dictators". The Huffington Post. Retrieved 9 December 2012. ^ "Julio Iglesias receives world record certificat in Beijing". Guinness World Record. 2 April 2013. Retrieved 24 December 2013. ^ Gratereaux, Alexandra (24 April 2013). "Latin Songwriters Hall of Fame Opens Honoring Julio Iglesias, Jose Feliciano". foxnews.com. Retrieved 30 November 2013. ^ Pajot, S. (12 December 2012). "Latin Songwriters Hall of Fame Launches in Miami, Announces 2013 Nominees". miaminewtimes.com. Retrieved 30 November 2013. ^ "Julio Iglesias și Julio Iglesias Jr., primul concert împreună" (in Romanian). Observator. 14 May 2015. ^ "Julio Iglesias Receives Honorary Degree from Berklee". Billboard. 9 May 2015. ^ Lacey Rose (12 June 2006). "Home Improvements - Most Expensive Home In The U.S. 2006: South". www.forbes.com. Retrieved 12 June 2006. ^ Sanchez, Mamen (20 September 2010). "Julio Iglesias & Miranda Rijnsburger: Married After 20 Years!". people.com. Retrieved 30 November 2013. ^ Lewis, Christina S. N. (5 January 2008). "Iglesias tears down and rebuilds rather than settling on low price". dailyherald.com. Retrieved 30 November 2013. ^ Owers, Paul (4 April 2012). "Report: Iglesias spends $15.2m for Miami-Dade home". sun-sentinel.com. Retrieved 30 November 2013. ^ Brennan, Morgan (10 September 2012). "Inside Indian Creek Island, Miami's Billionaire Bunker". forbes.com. Retrieved 30 November 2013. 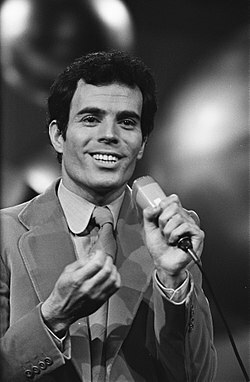 Wikimedia Commons has media related to Julio Iglesias. with "En un mundo nuevo"